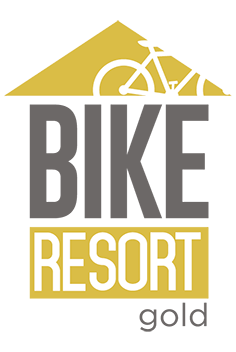 Hotel Garnì Pegrà has the highest level of certification of Bike Resort reserved for accommodation facilities that offer elite services for every type of biker (whether road cyclists, mountain bikers, gravity, cross country). The structures belonging to the “Gold” category combine exclusive comfort with a setting oriented towards outdoor and active holidays. The Garnì Pegrà is a bike hotel set in the very heart of the Alps, chosen by those who have a “passion for the dirt”, who love the challenge and who wish to feel “at one” with the mountain and with its natural landscapes. The natural surroundings are those offered by the Stelvio National Park, the Adamello Brenta Natural Park and the Adamello Regional Park. However, the hotel is also a destination of choice for road biking enthusiasts, who every year cycle kilometres on end through the mythical Gavia and Mortirolo passes, locations that have seen many champions of Italian cycling. The Ponte di Legno – Tonale area is synonymous with cycling. Our bike hotel offers solutions and services designed to allow you to take advantage of your vacation on two wheels in the best way possible. The passion for cycling and our experience in welcoming and catering to biking enthusiasts and professionals, has allowed us to continuously improve the services offered in this area. For us, pure fun and enjoyment, challenge, adrenaline and safety represent the true musts. The rest, we leave to nature, with its infinite offers for all tastes. You have selected one of the most magical locations in Italy for enjoying the company of your mountain bike. Here, you can count on 500 km of mountain biking between the Upper Camonica Valley and the Upper Sole Valley, embraced by the Stelvio National Park, the Adamello Brenta Natural Park and the Adamello Regional Park. A network of trails, forest paths and mule tracks dating back to the first World War, ringed into 18 routes of varying difficulty at 700 to 2,600 meters above sea level, passing through forests, pastures and fantastic high mountain landscapes. You can request a detailed map of the routes, work with our team of experts to select the itineraries that best suit your sense of adventure and technical capacity and engage in this challenge with yourself. Each itinerary identified on the map is provided with a description, mileage information, altitude differences and colours indicative of the route difficulty. Moreover, each route is marked with directional arrows and mapped with GPS coordinates. All routes can be viewed on the ADAMELLO BIKE site, where visitors can also download the GPS coordinates, in expectation of a biking adventure in the Adamello Bike Arena. Our guests can reach the high altitude trails directly from the hotel, taking advantage of the ski lift facilities located just 50 meters behind our structure: transportation of your bike is free! Kids can take advantage of the Bike Park located just in front of our hotel, where budding mountain bikers can learn to tackle obstacles and turns in the company of many friends. If you love distances, if you prefer covering kilometres of asphalt at great speeds, if you are fond of steep climbs and rapid descents, then you’re in the right place. From our hotel in the Tonale Pass, in just a matter of minutes you can reach fantastic road itineraries at high altitude and conquer peaks whose names have been written in the history of cycling, such as the Gavia and the Mortirolo passes. As you might well be aware, the rest cannot be explained, only experienced. The Mortirolo is a large valley of meadows and forests with peaks that reach up to 3,000 meters in height. For experienced cyclists, the Motirolo is the mountain to conquer! It can be said that the Motirolo is considered the most famous climb in Italy, following its discovery during the 1991 Giro d’Italia race. In truth, the Mortirolo pass is an extremely challenging route, one that must be faced not only with your legs, but also with your head. More than 12 kilometres with inclines that never go below 10%. The last kilometre of the route is among the most beautiful that any cyclist will ever experience, thanks in part to the changing landscape that transitions from forests to meadows, and in part because from that point to the summit, cyclists will find various encouragements written on the asphalt. The Gavia is another one of those legendary climbs that belongs to the history of cycling. The pass connects the Valfurva and the Valtellina to the Camonica Valley. The Valtellina slope offers a long route with a number of steep sections, while also including more ridable sections and an almost flat final stretch. On the other hand, the Camuno slope, situated near our hotel presents a very difficult route with inclines up to 17% and no chance for rest. And it is from here that cyclists can start their adventure, from the challenging Ponte di Legno climb (1,258 meters), not far from the hotel. The Garnì Pegrà is, in fact, located at the foot of the Tonale Pass and the Gavia pass. For those who love cycling but are not trained to climb the peaks of the Mortirolo or the Gavia, the Tonale Pass offers a less challenging yet equally impressive route, with an altitude of up to 1,880 meters. The Ponte di Legno slope offers the shortest option for reaching Tonale Pass. The route is approximately 12 km long, characterised by an initial section full of turns and a much straighter remaining section. The climb is not particularly challenging, therefore ideal for cyclists with less training or for those who have already clocked many kilometres in the saddle. On the other hand, the Trentino slope, along the Sole Valley, offers a much longer route and touches a number of points of historical interest. During the First World War, the front line passed precisely through here, traces of which still remain visible. The Stelvio National Park is a protected oasis of rare beauty which during the summer offers biking itineraries for every need and physical training level. The Stelvio Pass is not only an ideal destination for skiers and snowboarders who can count on peaks that reach 4,000 meters (runs at over 3,000 meters of altitude, majestic glaciers and unique alpine landscapes). The Stelvio also serves as a perfect retreat for cyclists in search of an ideal place to train and to immerse themselves in the silence, in the scents and in the colours of nature at high altitude. It was precisely the Stelvio Pass that on May 27, hosted the 16th stage of the Giro d’Italia race in Ponte di Legno – Val Martello, a location that provides an ideal summer destination for many cycling races and is extremely popular with professional cyclists. VIEW OUR SITE "BIKE HOTEL"